Last April, when Rebecca was here in Peru with me, we visited the ChocoMuseo, a chocolate museum where the held a “bean to bar” chocolate making workshop which she and I attended. We really had a lot of fun and learned a lot—roasting the fermented and dried beans, making two kinds of hot chocolate, grinding the beans, making chocolate candy. Delicious. At the time, we learned about the excursions that the ChocoMuseo offered to visit organic coffee and cacao plantations, but we just were not prepared to spend the money. This year, however, I decided the excursion was something I did not want to miss out on. So on Saturday, the company had enough people to make a trip across the high (14,500 foot) pass and down into the high cloud forest where coffee grows so well. After a three-hour trip over the MOST winding and twisting roads I have ever been on, we arrived at the farm of Julia and Jose and their sons, Miguel and Moises. As we tumbled out of the car, all looking a little green from the trip, we were welcomed warmly and shown to our private rooms and allowed to rest a bit and get the dizziness out of our heads. Then Julia had prepared a hearty lunch, complete with passion fruit juice, for us before we started on our tour of the farm. One of the first things I noticed was the “Programa Organico” sign near the kitchen. 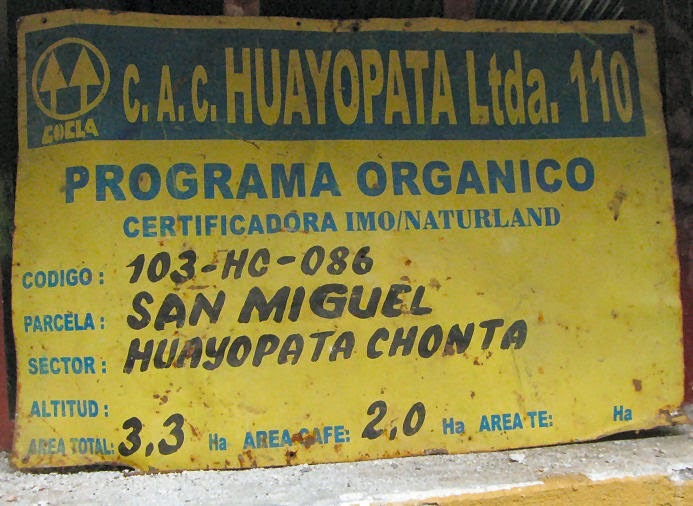 Both the farms we were visiting are certified organic by the government. Two to three times a year, the farm is inspected to be sure it is following all organic standards. If they fail the program, they are removed from it for 10 years! Jose, and our English-speaking guide, Abel, pointed out some of the unusual plants and fruits on the farm. Everything is interplanted here. 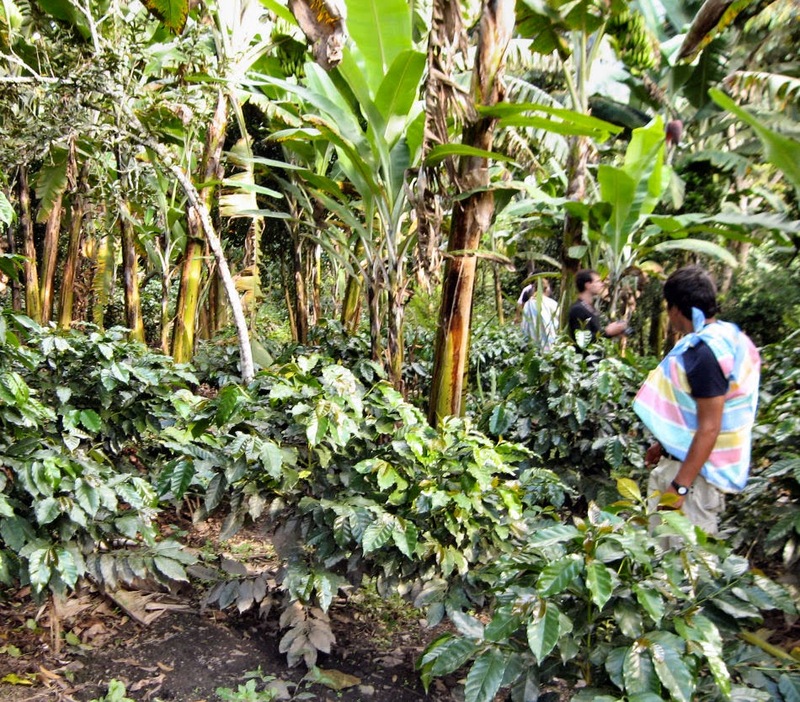 You don’t just see rows of coffee or cacao plants. It is a food forest where bananas, passion fruit, mandarins, achiote, limes, avocados and more, grow alongside the coffee plants. 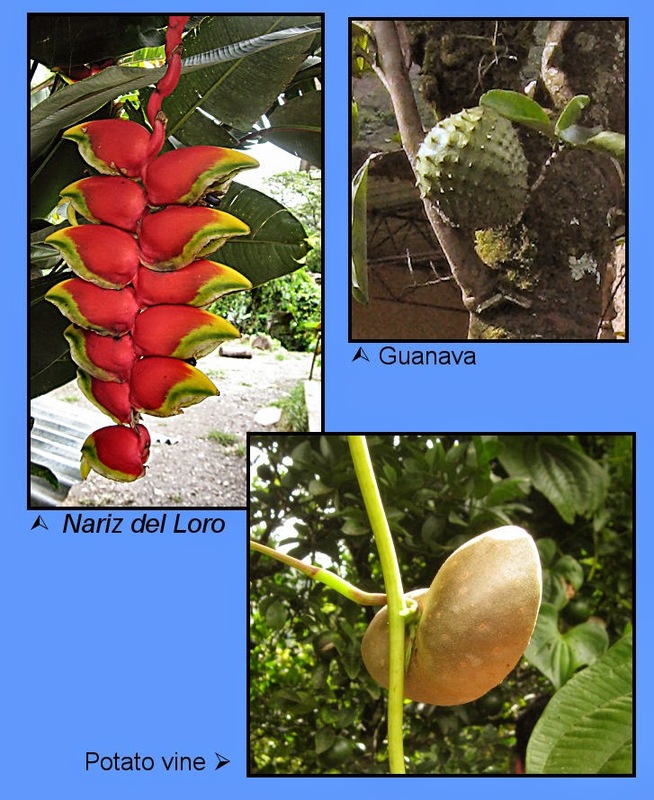 One colorful plant was the “Nariz del loro,” which is related to banana and the flower even looks like banana flowers, but it is only ornamental. The individual blossoms look like a parrot’s nose (nariz del loro). We also saw potato vine, which is a true potato, except that the potatoes grow above ground on the vine itself. Abel told us that they make good “papas fritas” (fried potatoes). 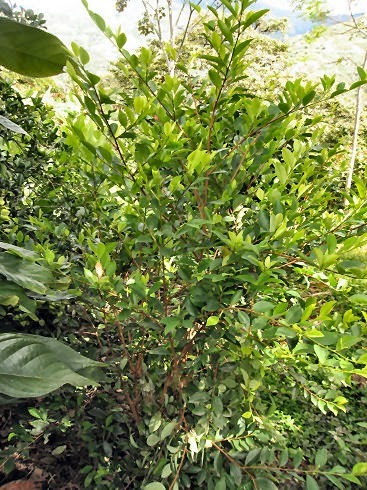 The leaves from the guanava are made into a tea which is a cancer preventative and in Brazil, anti-cancer medicines are made from this tree. Planting coffee seeds in river sand through which boiling water has been passed to kill insects. Banana trunks are cut after each fruit stalk is harvested. The water in the trunks, which is high in potassium and other minerals, then flows down to provide enriched water for the coffee plants. We harvested some beans to take back and learn how the beans are processed. 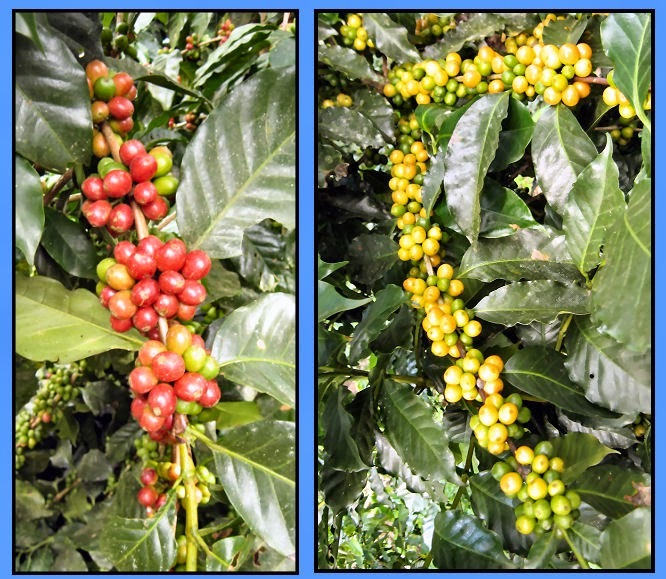 Most of the coffee beans from this farm go to a local cooperative where they are processed to the “green bean” stage (see below). Julia and Jose’s family keeps only some of them for their own use and processes those by hand. First the beans are run through a mill which removes the red fruit pulp. The beans are allowed to ferment for 12 hours in the large tank, and then they are washed to remove the slimy fermented flesh. After drying in the sun for 3-5 days until 12% humidity is reached, the hulls of the seed are peeled by machine and the “green” beans are ready for export. We peeled our own in a small molino (mill), and Jose winnowed them by hand. They were roasted for about 20 minutes. There are three ways to know the roasting is completed: by color, odor, and sound (crackling). Then same molino was adjusted to a different size and used to grind the beans for Jose to make us some delicious coffee. 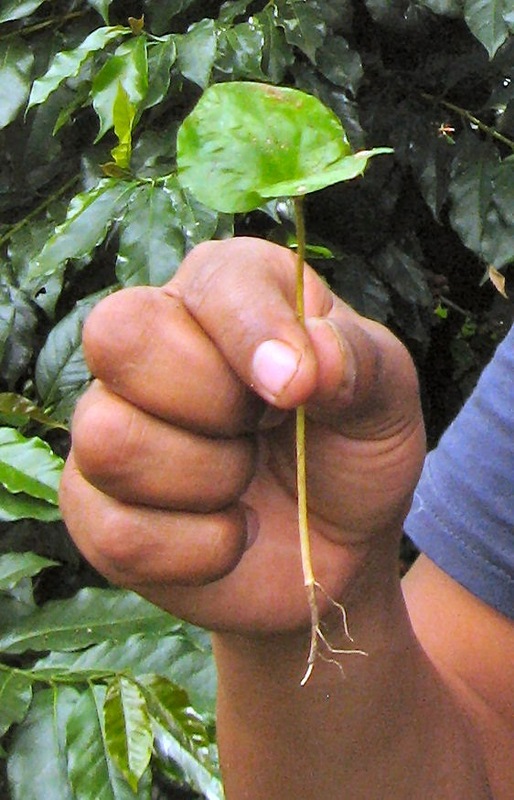 40% of Peru’s organic coffee goes to the US and most of the rest is exported to Europe. You can read more about the ChocoMuseo’s chocolate-making workshops and tours to these organic farms here. Jose’s Bees – The honey we had for our meals tasted like bananas! In my next blog post, I will share what our second day on this excursion was like.